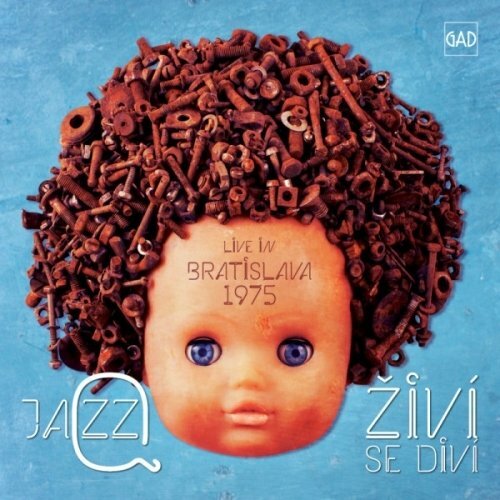 On February 2, 1975, the six-piece Jazz Q arrived from their home base in Prague (now the Czech Republic) to play at the Bratislava Lyra Festival in Slovakia. Of course in those days both cities were part of the same nation, Czechoslovakia. Bratislava would come to be a major jazz center of Eastern Europe with the annual Bratislava Jazz Days festival, which began later in ’75 and continues onward to this day. At that point the band was at a turning point; the early Jazz Q founded in the mid-60s by keyboardist Martin Kratochvil and woodwind player Jiří Stivín was an amalgam of rock, blues and jazz styles, as evidenced on the 1970 album Coniunctio (with Blue Effect), which still featured Stivín, as well as the post-Stivín albums Pozorovatelna and Symbiosis, from 1973 and ’74 respectively, the latter which featured guitarist František Francl, and singer Joan Duggan, who are also featured in this live set, along with new members Přemsyl Faukner (bass), Libor Laun (drums), and Jan Martinec (violin, soprano sax, harmonica). But by this stage, Kratochvil was leading the band in a more decidedly jazz-fusion direction, heavily influenced by Mahavishnu, Joe Zawinul, Herbie Hancock, and Billy Cobham – clearly evidenced in this set, amid the outstanding originals, are covers of “Sanctuary” from Birds of Fire, as well as Billy Cobham’s “Stratus.” The remainder of the material is in a similar zone, with Kratochvil’s “Tůň,” “Přítel Dynamit,” “Mlýn,” and the title track being among the standouts. Shortly after this performance, Kratochvil would head off to study at Berklee, Duggan and Martinec would leave the band, and then Kratochvil would return and reconvene the others in 1976 to record the next Jazz Q album Elegie, from that point onward in a full-on fusion direction. This pretty much captures the band at the peak of their powers, and is an excellent supplement to Jazz Q’s 2007 eight disc boxed set which includes all their albums from 1973-91 plus a full disc of bonus material.